There is but one law in nature, eat or be eaten. Well, I know where this is headed. Simpsons didn't do it, but french animators did. The day before I had abdominal surgery, I ate the one pound burger from Fuddruckers. While wild burgers may taste better than domestic ones, they do get cold faster. And no-one likes a cold burger. That size of burger is more the one you air-lift into disaster areas. After making sure it's properly restrained of course. 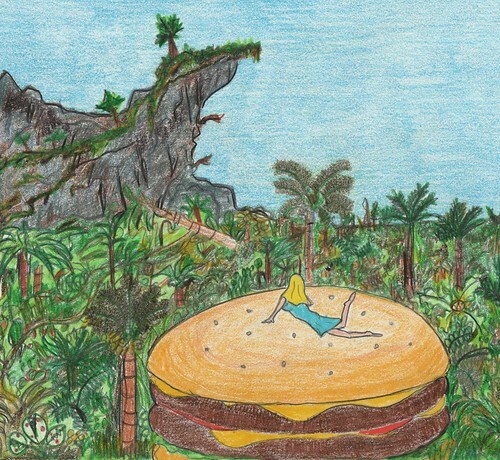 This Burger King Kong story is one of tragic love and can only end in a long fall from a tall building. It takes time for a lady to develop feelings for the wild hamburger. It is a luxury these star-crossed lovers do not have. I ask you. Who are the real monsters? The burgers, or those who seek only to eat them? And what is Burger King Kong going to fight?, Chipasaurus Rex?, McBrontosaurus?. You could have used the picture in this thread in order to avoid doing any work for an entire week. I'm disapointed in you, Lerman. a french fry as big as a tower. The professions of love, the marriage proposal, a once lost elegy to a savory age of yore, they are all like tiny hamburgerlets for my hungry soul. They do not go unappreciated. I thought about including it in today's issue but there are things that bother me about the image. Perhaps it is jealousy. She made her choice and I have to respect it. Who can resist the Giant Hamburger? Now that they're out there in the wild, this thread will be my Director's Cut. I'll win her back with SCIENCE! Who could blame her for loving the Giant Hamburger? After all, it is quite a dish. I would second Saviordd1's marriage proposal, but it seems you've given your heart to another soul, and your brain to a hamburger. Only a monster would get in the way of true love and/or fast food themed organ transplant. 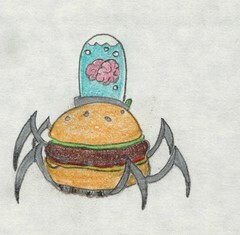 Best of luck in your quest, Arachnoburger. That would be stupid. It's going to be Hot Dogzilla. "Twas beauty that killed the feast." Truly, the end of days is upon us. Enjoy the sandwiches whilst you still can, for they shall not spare any who has trespassed against their kin. Every time sir you manage to crack the icy facade of my mouth with a smile. Such wit and artistic vision... Seriously this is stuff I'd collect in a book format. What's next? The Planet of the Crepes? Gastronomic Park? Cheddar versus Gouda? Where will it end? !